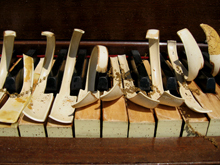 There are an infinite number of variables that affect the perception of sound. As an example, just a few considerations might be: what is the source of the sound wave? What is the position of the source of the sound wave in the space it is occupying? What is the physical shape of the space in which the sound wave is originating? How big is the space? To record a sound wave introduces a myriad of additional options. So what is the aim of recording restoration? The archival viewpoint suggests that a good recording restoration should present the listener with the most authentic reproduction of the original sound that can be obtained. But what about the creative influence of the original recording process? With modern recordings, the ensemble sound often exists only on the recording medium, and many parts of it have probably never been through a microphone. Therefore the commercially minded engineer may, in contrast, attempt to generate a new recording more appropriate to its intended use. This use could be, for example, to please the public palate, or to represent accurately the sound of an era. Every restoration has its own criteria. Encore Consultants LLC's Pleasant Lane Studio is but one of ten studios in the United States equipped with a full complement of CEDAR® audio restoration technology. This of course enables us to proceed with recording restoration in technically limitless ways. However, it is our policy that the human ear should always be the final arbiter of sound quality; judgments based upon signal processing techniques are secondary considerations. 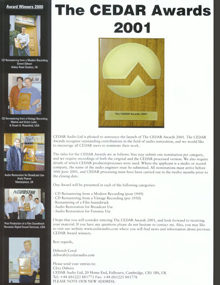 "The CEDAR® Awards recognize outstanding contributions in the field of audio restoration. 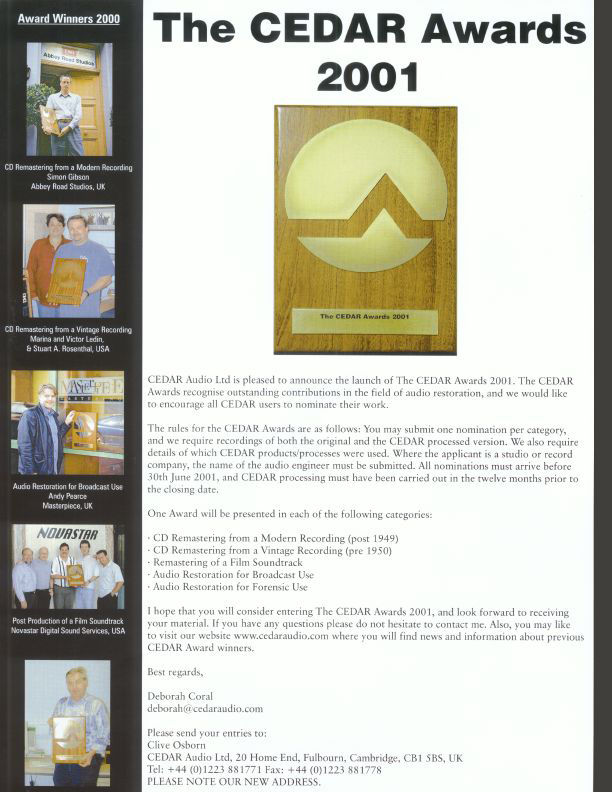 A panel of audio restoration experts and CEDAR® in-house audio engineers carries out the judging. 'Before' and 'after' samples of all award submissions are reviewed because the key consideration is that the source materials be restored without changing the fundamental nature of the original recording." We are delighted to have been awarded the prestigious CEDAR® 2000 Award for our "CD Remastering from a Vintage Recording (pre 1950)" of Benno Moisewitsch performing Tchaikovsky's Piano Concerto No. 2 and the Liverpool Philharmonic with George Weldon conducting.